Have you ever ordered a drink at the fast-food restaurant Sonic? If you did, you may have noticed that your drink did not contain ice cubes or ice chunks. Instead, it was filled with small, soft "nuggets" of ice, similar to the kind used to make snow cones. Ever since Sonic became popular, people have been going crazy for the ice and wondering how they can get it right in their homes to use with their own drinks. Some ice makers do create ice that is similar to the nuggets made by Sonic. We've reviewed a few that are out on the market right now. W​​​​​​hy Get a Sonic Ice Maker? Why Get a Sonic Ice Maker? The tiny ice flakes don't just make your drink cold. They seem to absorb your drink, making it delicious right down to the last drop. Sonic ice can be used for alcoholic beverages such as cocktails, for juice and soda, or just to make a glass of water seem even more refreshing. One spokesperson from Sonic mentioned that the beauty in this ice may be that it melts at just the right pace. Larger ice cubes can water down a drink. Sonic ice may be the first ice in history to have its own fanbase! Some Sonic restaurants even sell bags of their ice. If you have a Sonic Ice maker of your own, though, you'll be able to make delicious drinks in the comfort of your own home. The Opal Nugget Ice Maker is a compact, portable Sonic ice maker that can make enough ice for a drink or two in fifteen minutes. Sonic ice makers can be found from anywhere from $ to $$$. The larger ones that need to be installed under the counter tend to be more expensive. Smaller ones, which may be portable but may not have the capability to make and store as much ice, tend to be less expensive. This Sonic ice maker has some great features. It has a sensor that can tell when its bin is full so that it stops making ice before the bin overflows. You can keep this on and always have a bin of ice on hand. It also works with an app for your phone so that you can schedule the ice maker to start making ice at a certain time or ask it to start making ice in order for you to have it ready by the time you get home. If you don't use up the ice that drops into the bin, it will melt and be recycled into more ice nuggets. Reviewers have said that this ice maker makes the ice that is the most identical to the kind found in Sonic drinks. The Opal Nugget Ice Maker works differently from most ice makers. It works by scraping ice flakes from a chilled cylinder. The flakes are then squished together into little icy nuggets. The compact size is great for portability if you want to bring this Sonic ice maker to a party, and the fact that it works with an app is awesome. Some of the other things reviewers liked about it were that it has a stylish design that won't interfere with the design of your kitchen, and it doesn't need to be hooked up to a water line. There is no installation is needed. Reviewers also liked the clear ice tray that allows you to see the ice as soon as it is made. However, the bin size is rather small; it can only hold 3 pounds of ice at once. It also needs to be used with distilled water in order to create the best quality ice. If you try to use it with regular tap water, the ice may not come out as well. Reviewers also mentioned that it may stop working when it needs to be cleaned and that it is hard to clean. A cleaning kit is sold separately on the company's website. One more complaint was that it can be noisy when making the ice, creating a sound that is comparable to the sound of a hand mixer. The Opal Nugget Ice Maker comes with a one-year limited warranty. If you have problems that are covered by the warranty, the company will refund your money or replace your ice maker. This Sonic ice maker measures 15 inches wide, 23 inches deep, and 34 inches high, and is meant to be installed under your kitchen counter. It can produce 85 pounds of ice every 24 hours. This product's company refers to the ice it makes as "pearl ice," which they promise blends quickly and absorbs liquid, just like the ice found at Sonic. The Ice-o-Matic ice maker features an insulated chest that can hold 22 pounds of ice at a time. When the chest is full, the Ice-o-Matic quits making ice until more is needed. It has an indicator light to let you know if it stops getting water for any reason, and another indicator light to let you know when it is time to clean it. It also uses the Pure Ice System, which is a silver-based antimicrobial compound that prevents fungus and bacteria from growing inside the machine. With this feature, you can rest assured that your ice is safe to consume. This Sonic ice maker is approved for outdoor use, unlike some of the other ice makers on our list, but it will need a water line to be hooked up to. One of the few complaints we have about the design is that the chest which the ice is stored in is only insulated, not refrigerated. This means it is basically the same as storing ice in a cooler. Eventually, if the ice is not used, it will melt. This shouldn't be a huge problem since the Ice-o-Matic will make more. Another complaint is that it can be tricky to install, and if you're not familiar with installing appliances under your counter, you might need to get a professional to help you. Reviewers have also noted that this Sonic ice maker is much quieter than others. The Ice-o-Matic comes with a one-year warranty. This Sonic ice maker dispenses both ice and water. This is a countertop model ice maker that can make up to 315 pounds of ice in 24 hours. Ice lovers have the ability to dispense either water, ice, or ice mixed with water, from a spigot into a glass or cup. It has a touchless activation feature that allows you to fill your cup just by holding it under the spigot, without having to push a button. It also has a storage bin that can hold up to 10 pounds of ice. The Manitowic Ice Maker and Water Dispenser is made of stainless steel that will look great in any kitchen. This product comes with a two-year warranty. This is a compact, lightweight Sonic ice maker that is portable enough to bring anywhere. Although this ice maker only weighs 20 pounds, it can make 26 pounds of ice per day. However, it can only dispense about 9 ice cubes at a time, every six minutes. You can choose whether you want nuggets or larger ice cubes. It has an indicator light to let you know when you need to add more water or when the ice bucket is full. One bonus feature of this ice maker is that if you don't use the ice that has been dispensed into the ice bucket, it melts back into the ice maker and is recycled to make more ice. This means there is no wet mess for you to clean up. Reviewers have pointed out that this does not exactly make Sonic ice. It dispenses two different sizes of ice, and the smaller size is similar to, but not quite exactly the same as, Sonic ice. Your ice cubes will be softer and more chewable if you use filtered water instead of plain tap water. This comes in three different colors, so it is possible to buy one that matches the decorations in your kitchen. We've looked at some of the best Sonic ice makers on the market and our conclusion is that the Opal Nugget Ice Maker is a good choice for the serious ice enthusiast. We like that it is smaller than a full-sized, under the counter ice maker, and that you don't have to hook it up to anything or do a lot of work to install it. 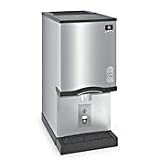 In fact, although it is not the smallest ice maker on the market, it is small enough that you can bring it with you to parties or take it with you on vacation. We like that it has a sensor that can tell when the basket is low on ice or when it is full so that you can always have the perfect amount of ice ready for you as long as you keep the water reservoir full. We like the sleek, stylish appearance that will impress your guests when you invite them over for drinks. Guests will especially be interested in the clear ice tray that allows you to see the ice as it is made. We are also excited about the fact that this Sonic ice maker has its own app, which you can use to schedule ice to be made right when you need it. Selling for around $435 on Amazon, this Sonic ice maker is not the cheapest ice maker on the market. However, it is less expensive than the large, under the counter ones. If you really love Sonic style ice and you want to be able to serve it to yourself and your guests any time you want, this could be a great investment for your household. Plus, you may save some money in the long run because you won't have to run to Sonic whenever you are craving an icy drink anymore!